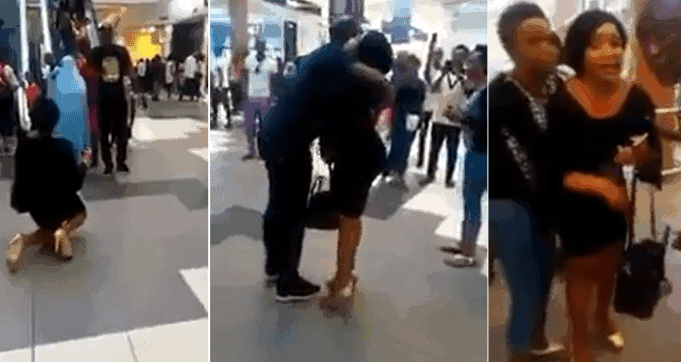 The video footage trending online shows a Nigerian lady left devastated after she made a public proposal to her boyfriend of 4years at the mall and got turned down. The light skinned lady who might have waited for him to propose, took it upon herself to do the asking inside a mall. 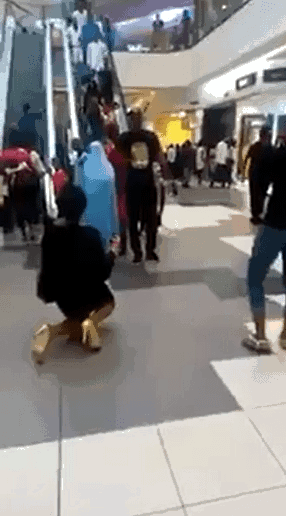 In the video, the lady knelt down with a ring in her hand as she gestured to her boyfriend upon seeing him to accept the proposal. The man appeared shocked and embarrassed, declines the proposal, moved away without taking the ring from her. After what seems like a second thought, goes close to her helps her get up, hugs her. One would have assumed that he was ready to accept the proposal but instead, whispered to her and walked away. She broke down in tears and nearly ran mad. It was later discovered that her boyfriend of 4years has been married for a while and apparently deceiving her. Guys what is your opinion regarding this?